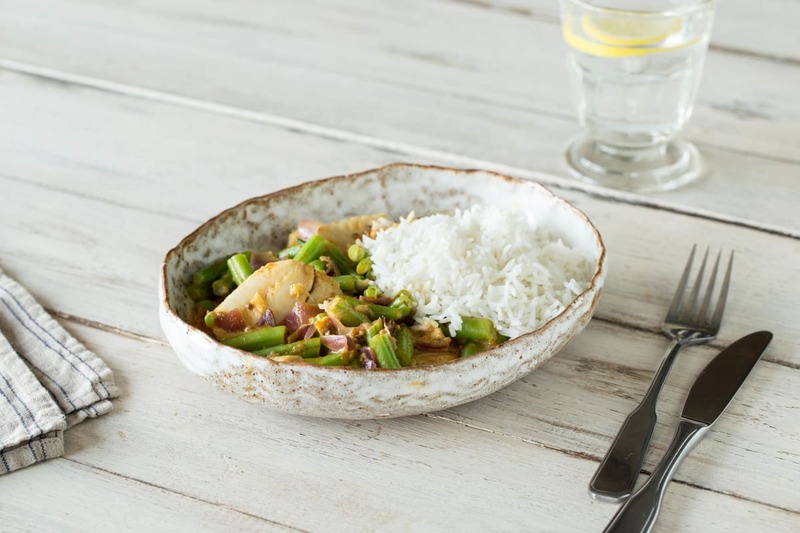 This dish is inspired by Mimi’s time on the Indian coast. It’s a delicate, fresh tasting little number that will transport your taste buds to the village of Varkala in southern India! 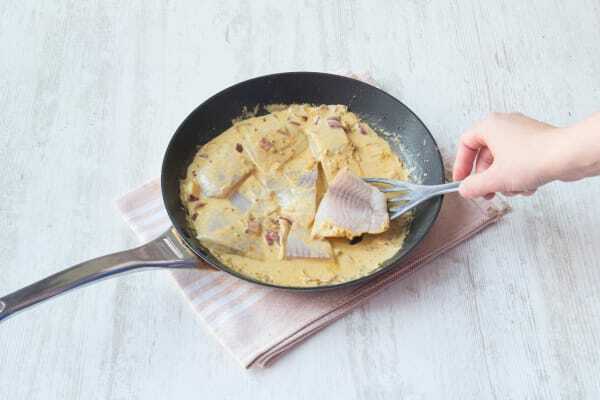 Traditional Indian fish dishes often involve marinating for several hours but we’ve used some HelloFresh magic to whip this one up in just half an hour, using a Bang Curry Spice - enjoy! Boil 350ml water in a pan with the stock pot for the rice. 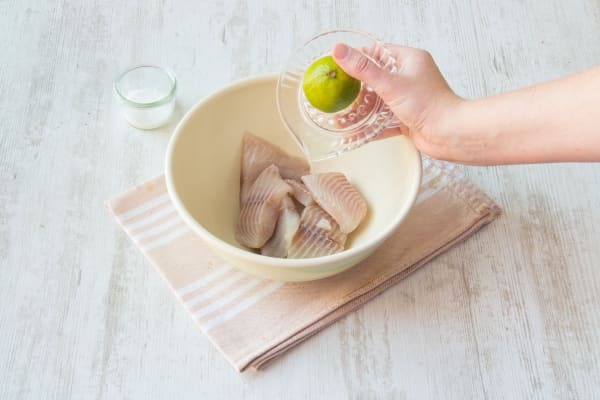 Chop each tilapia fillet into three and put in a bowl with the juice of half the lime and a pinch of salt. Tip: If the fillets have split already and you end up with them being cut into more than three pieces that’s fine, you just don’t want them too tiny. Now you need to get all your chopping done! Peel and chop the onion into roughly 1cm pieces. Then peel and finely chop the garlic and the ginger. 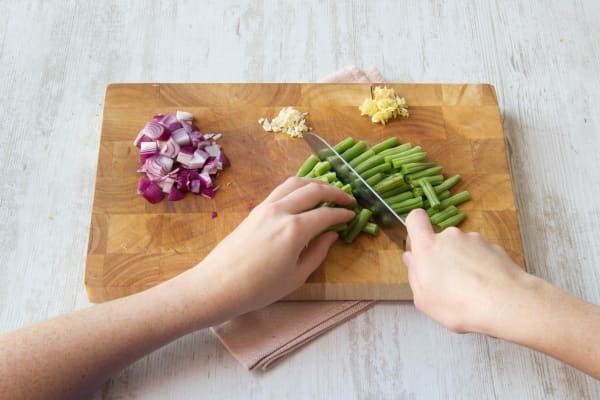 Trim the tops and bottoms off the green beans and cut them into three, setting them aside for later. Once your water is boiling, add your rice. 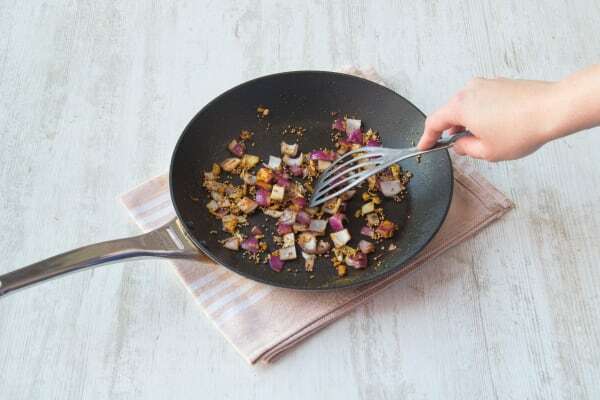 Cover the pan with a lid and leave on a low heat for 10 mins. After 10 mins remove the pan from the heat and leave to rest for a further 10 mins. Tip: If you end up having to leave the rice off the heat for longer than 10 mins don’t panic, it will be fine! Add 1 tbsp of olive oil to a pan and add the mustard seeds. Once they begin to make a spluttering sound add the onion, garlic and ginger. Cook on a low heat for 5 mins until the onion is soft. Add the spice mix and cook for 2 mins. Tip: If you want your curry mild just add half the spice mix. Tip: If you leave the mustard seeds for too long on their own they’ll start jumping out of the pan, so make sure to only heat them for 20 seconds before you add the rest! Pour in the coconut milk, 100ml water and stir everything together. Allow it to bubble away steadily while you get on with the beans. Put a pot of water on to boil with a pinch of salt. Once it is boiling add the beans and cook for about 5 mins. Drain and set aside the beans. When the rice is about 4 mins from being ready, add the fish to the sauce, gently covering it. Tip: Do not stir it or all the lovely pieces of fish will break up. Put the lid on the curry and cook for 4 mins on a low heat. Add the beans to the curry and gently stir them in, being careful of the fish. Serve a generous heap of rice with the delicious curry, making sure everyone gets lashings of the lovely, flavoursome sauce.